According to MayoClinic.com, spider veins, a common, mild form of varicose veins, are most likely to occur on the legs and feet, but they can appear on any part of the body. While spider veins are often simply a cosmetic problem, they can be uncomfortable and painful for some. However, there are some home remedies that can help to get rid of spider veins with natural ingredients. These treatments have not been approved by the FDA, however, so talk to your doctor before starting any new treatment. According to Julie Gabriel, author of "The Green Beauty Guide: Your Essential Resource to Organic and Natural Skin Care, Hair Care, Makeup, and Fragrances,” a mixture of vitamin E oil and witch hazel can be applied to the skin on the face to help get rid of spider veins. To make and use this mixture, combine 1 tbsp. vitamin E oil and 1/2 tbsp. witch hazel in a small container with a tight-fitting lid and shake vigorously to combine. Gently massage a small amount of the mixture onto the affected area and leave it on until it dries. Rinse the area with cool, clean water and pat dry with a clean towel. There is no need to wash with a cleanser unless the mixture bothers your skin. This treatment can be repeated three times per day unless irritation occurs. According to Ann Worwood, author of "The Complete Book of Essential Oils and Aromatherapy,” a mixture of carrot essential oil, spinach essential oil and jojoba oil can be applied to the skin to help reduce spider veins. To make and use this mixture, combine 1 tsp. carrot essential oil, 1 tsp. 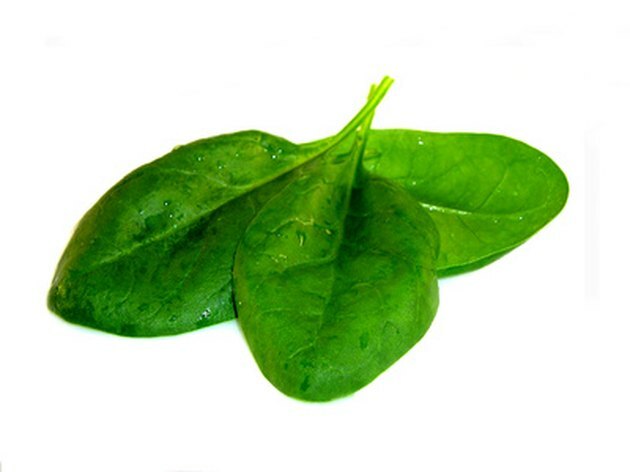 spinach essential oil and 20 tsp. jojoba oil in a bottle or jar and shake to combine. Pour a small amount of the mixture onto a clean cotton pad and dab the cotton pad on the affected area. Leave the mixture on the skin for 20 to 25 minutes or until nearly dry and rinse with cool, clean water. You do not have to wash with soap unless the mixture bothers your skin. This treatment can be done twice per day, and unused portions of the mixture will keep for 30 days in a cool, dark place. According to Ann Worwood, a combination of cypress essential oil and sweet almond oil can help to clear up spider veins on the body and face. To make and use this mixture, combine 1 tbsp. cypress essential oil with 8 tbsp. sweet almond oil and shake vigorously to combine. Pour a small amount of the mixture onto a clean cotton ball and dab the liquid onto the affected area. Leave the mixture on the skin for 20 minutes before rinsing with clean, cool water and patting the skin dry. There is no need to wash with soap unless the mixture irritates your skin or causes excessive redness. This treatment can be used daily, and unused portions of the mixture can be stored in dark, cool and dry place for up to one month.